Home › Economy › Will the new Government be successful in boosting growth and competitiveness with its present programme? With the crisis, public expenses increase and public income decreases. Sipilä, who used to be a manager, has apparently with some logic decided to cut in the public expenses, as private citizens and companies do when their income decreases. But life is not so simple, and Sipilä will discover it rapidly: in a company, the customers are in majority not employees of the company. So if you reduce the costs, you can sell more because you are becoming more competitive, and the customers will buy more of your products. In a country, reducing the public expenses means generally reducing the financial transfers to the population, whose income will go down. In this case, the population buys less products, and the consumption taxes, including VAT, go down. When people get less income, the income taxes go also down. Clearly the cuts in public expenses, which are mainly targeting the young families with children, the pensioners, and the unemployed, are going to cause a depression on the Finnish economy, and there are good chances that it happens fast because these groups, which generally are not the ones with sufficient incomes to have huge savings, are going to anticipate immediately a lower income, even if the measures are implemented only next year. The main question is to know if this depressing effect will be compensated by an increase in the exportations, which represent around 45 % of Finnish GNP. The measures recently taken by the European Commission (with the Juncker Plan) and by the European Central Bank (massive public asset purchase programme) have already begun to boost the growth in some countries, but not yet in Finland. The measures taken by the government to facilitate the life of companies are not going to be very useful if there are no external markets to compensate for the loss on the internal market due to budget cuts. This is where Sipilä is pushing for what he calls a social contract, in order to decrease the labour costs of Finnish companies, and thus increase their competitiveness. It is also the reason why he wants to do it fast, pushing the social partners to agree in summer, which is quite difficult if you read the last interventions of the trade unions. Is this policy efficient? It depends a lot on the possibility for Finnish companies to find new markets by lowering their prices. One first difficulty is that lowering the labour costs for companies does not mean that they will invest more: the shareholders may instead benefit from higher dividends, which has no positive economic impact. Another difficulty is that there is a strong competition on international markets, and in order to be competitive, the prices (linked to the labour costs) are not really the main determinant for developed countries, in particular when the competitors are for example China and India. One important element is the added value of the products sold. From this point of view, and it has been a little underestimated in the government programme, Finland’s situation seems almost catastrophic: the exports of high-technology products with high R&D intensity (such as in aerospace, computers, pharmaceuticals, scientific instruments electrical machinery…) went from 25.1 % of manufactured exports in 2005 to 7.2 % in 2013. For this reason, Finland has some difficulties to be competitive, even if the situation of exports has been mechanically improving in the last months because of the demand, in particular from other EU member states whose market is improving. So the lack of competitiveness on the Finnish side is not only a problem of costs, but also of innovation, as indicated by the European Commission and by the OECD in their annual analysis of Finland. Curiously, these elements are not addressed clearly in the government’s programme: you find a chapter on employment and competitiveness where everything is about deregulation, limiting the costs for companies, and reforming unemployment security and public services, and another on knowledge and education where you can find a sentence on competitive centres of excellence pooling knowledge and expertise for higher education institutions and research institutes, and something about commercialisation of research results, without any reference to strengthening the links between higher education and research institutions and industry, through for example a better support to public-private clusters and projects. There seems also to be no reference to any incentive for companies to invest instead of distributing dividends, as sometimes requested by shareholders who have a tendency to want fast returns on their investments. In particular, other European countries have recently increased incentives in favour of private investments in different fields of research, and in other cases have publicly funded research and development projects. There is in the government programme the idea of 1,6 billion euros investments in strategic priorities (financed in particular by the EU Investment fund that the National Coalition Party refused to use until now, and by the European Investment Bank), but it is late (end 2018), insufficient, and will not produce any rapid result. We are very far from what Finland did to face the crisis in the beginning of the 90s. One can also be surprised by the absence of reference to the need for foreign investments in Finland, except form the point of view of facilitating the recruitment of foreign talents. It may be useful: for example, these last years have seen a development of data centres in Finland, such as Google in Hamina, which means that Finland is not lacking some assets to attract top level companies needing a EU basis. Traditionally, it is considered that sustainable growth for a country is mainly depending on the quality of the workforce, which is improved by education and training, and the quality of the capital, which is improved in particular by the quality of education and research. From this point of view, Finland is considered to be quite successful until now, with the weakness already indicated that the capacity to innovate in the production through research seems weak even if the research expenses are high. But again the government’s programme cutting resources for education and research (at least 600 million euros) look like a mistake. In conclusion, it appears that the government may be facing at least a short-term problem, with measures which will depress the economy and diminish the public resources, even if the export situation is improving due to external factors. In addition, the present government programme is lacking a strong research policy linking public and private sector, and the cuts on education, the absence of incentives to invest instead of distributing dividends or investing on financial markets, and the lack of a policy for attracting foreign investments may hamper the efforts that are asked from the population and the public services. 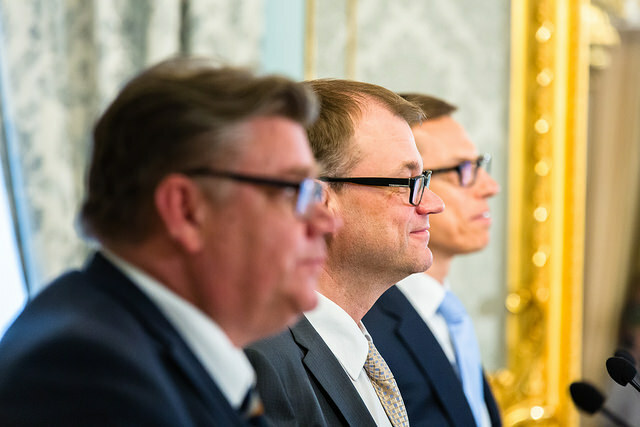 ‹ Sipilä’s social contract: is the government very clever, very inexperienced or simply dumb?